1. J.K. Rowling - While I'd love to meet J.K. Rowling for myself, there's another part of me that wants to be able to attend one of her signing's with my husband. He's not a big reader, but he's addicted to this series. 2. Jojo Moyes - I've got a signed copy of One Plus One because Ellice was lovely enough to get me one when Jojo visited a bookstore near her. But I've still got meeting Jojo myself on my wishlist! I hope it happens one day. 3. Melina Marchetta - Has Melina ever come to the US? I'm assuming she has, but I need to know if I've got a hope of meeting her. Is it totally insane that I'd want to fly to New York to meet if she came there? Probably. 4. Suzanne Collins - I'll admit that Suzanne Collins didn't immediately come to mind, but I felt like an idiot when I realized I'd left her off. I'd totally make her sign my four The Hunger Games sets. Yes, four. OBSESSED. 5. Julie Berry - I've only read All the Truth That's In Me from this author, but I love it so much that I own three copies of it. It's definitely one of my all-time favorite reads! I'd love to be able to get it signed. 6. Erin Lindsay McCabe - I absolutely love chatting with Erin online, and I've technically already got a signed copy of I Shall Be Near to You because she sent one my way. But I'm still hoping I'll get to meet her in person! 7. Rae Carson - I was super late to The Girl of Fire and Thorns trilogy, but I fell in love with the books once I finally gave them a chance. I can't wait to read her next book! Maybe her book tour will bring her near me? 8. Mhairi McFarlane - I've recently fallen in love with Mhairi's books, and I'd love to meet her. She's on my list of favorite authors! While I doubt this will ever happen since she lives in England, I can still dream... Right?! 9. Sarah Rees Brennan - I adored The Lynburn Legacy series, and I think Sarah seems hilarious based on what she says on Twitter. Alexa met her earlier this year and had nothing be wonderful things to say! 10. Emery Lord - In my mind, Emery and I are already friends. Soooo... is it too much to ask for her to come to Atlanta to make it official? I don't want to overwhelm her with my love though, so I'd act totally mostly cool. 11. Taylor Jenkins Reid - I read my first Taylor Jenkins Reid book last year, and I quickly devoured her second book a few months later. And I've been wishing I could meet her ever since! 12. Liza Palmer - I think Liza might be at the very top of my "authors I really want to meet" list! I've got a signed copy of Nowhere but Home (seriously, she's THE BEST), but I still not-so-secretly hope she's in Atlanta someday. 13. Julie Buxbaum - Julie hasn't written anything in a while, but I've read her debut novel, The Opposite of Love, at least five times. Yes, I'm that in love with it. I'd love to be able to tell her how much her book means to me! There are so many authors on your list that I want to meet too! Jojo Moyes, Liza Palmer, Taylor Jenkins Reid, and Rae Carson, in particular are on my list as well. And I would kill to properly sit down with JK Rowling and chat about Harry Potter, which is one of the series that changed my life. I'm still happy I met her in some capacity though! But one day, I'll get her to sign my Harry Potter books, I hope. AND have I ever told you that I missed out on Melina Marchetta? I attended a group event with her, Gayle Forman and Kristin Cashore, but I didn't go to get any books signed. WHAT WAS I THINKING? It's NOT insane if you want to fly to a city just to meet an author. Not at all! Emery Lord would be amazing in person. I feel like she'd be chill AND feisty, especially if you get her talking about feminism. There are times I really love living in the middle of nowhere, NJ, but then I think if we lived somewhere a bit more urban, I might get the chance to meet some authors! What a great list! I really wish that my city had more popular authors come to visit ... it seems like we had one really, really good group of authors come for an event and then nothing since then. It was a nice event since it really brought the local book bloggers together and I kind of think that some of them might still be around if we had more awesome events like that. I wish I lived in a city where authors came all the time! 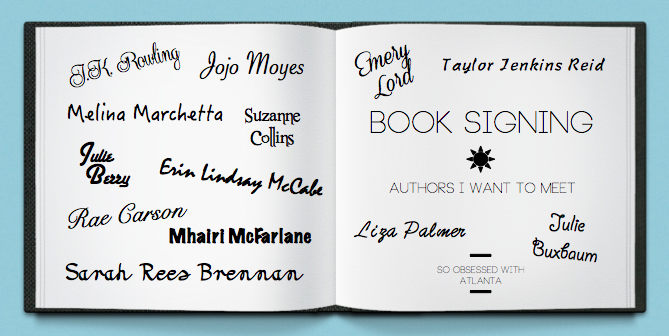 I think I would love to meet Neil Gaiman, Jojo Moyes, Sarah Dessen, and Stephanie Perkins. Just to name a few!